An award-winning photojournalist, an Olympic medal winner, a highly-respected university leader and a scientist who helped land and maneuver an all-terrain vehicle on Mars: these descriptors belong to the featured speakers at the 46th Annual Chancellor’s Council Meeting & Symposium, which was held at The University of Texas at Austin’s Frank Erwin Center on May 3, 2013. 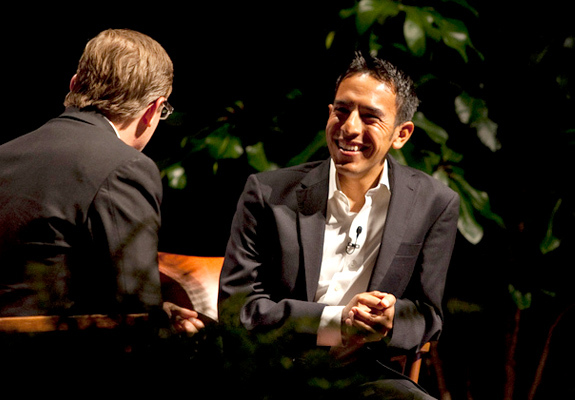 The speakers, who were interviewed by Evan Smith, CEO and editor-in-chief of The Texas Tribune, discussed subjects ranging from traveling the world to exploring space, from showing grit to displaying humanity. While they all followed different paths in life, Michael Ainsworth, Leo Manzano, Diana Natalicio and Michael Watkins all started in the same place: at a University of Texas institution. More than 800 Chancellor’s Council members joined Chancellor Francisco Cigarroa for a special day beginning with Discovery Sessions that took some Council members on tours of the The Blanton Museum of Art and The Lyndon B. Johnson Presidential Library. Other Council members listened as Roger Rosenberg, M.D., from UT Southwestern Medical Center discussed his latest research on Alzheimer's disease. Read about Rosenberg’s lecture. The quest to find cures for diseases and solutions to problems often originates when public awareness is heightened. In late August 2005, Hurricane Katrina slammed into the Gulf Coast and New Orleans. Photographer Michael Ainsworth was there soon afterward to capture the images that would bear witness to the ferocity of the storm and its terrible impact on those who could not escape it. The photographs taken by Ainsworth and his colleagues at the Dallas Morning News earned them a Pulitzer Prize. In 2013, Ainsworth again focused his lens on the aftermath of a disaster. This time, the site was closer to home. When a fertilizer plant exploded in West—a small city about an hour south of Dallas—the blast leveled buildings nearby. In a single image, Ainsworth reveals the totality of the destruction and suggests the challenges that lay ahead. 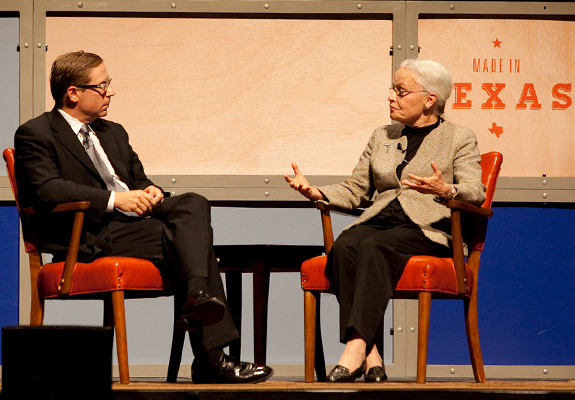 Diana Natalicio, Ph.D., president of The University of Texas at El Paso, has had a profound influence on the lives of many people. For more than 25 years, Natalicio has focused her considerable energy on enhancing the quality of educational programs at UTEP, which will be celebrating its centennial next year. During her tenure, Natalicio has helped to build a culture of high expectations at the university, and she has encouraged faculty, staff and students to see opportunities where they once saw challenges, to embrace the diversity that makes them unique. "We were imitating other universities that were not like us," Natalicio observes. She adds that UTEP became a singular institution when she, her staff, faculty members and students began to accept what made them distinctive. If he needed any validation that he chose the right career, Michael Watkins, Ph.D., no doubt received it on August 6, 2012. That was the day the nuclear-powered, all-terrain vehicle Curiosity landed on Mars. "We were intellectually confident, but emotionally terrified," says Watkins of the mission he and his team had spent eight years planning, and which would all come down to a seven-minute landing (NASA has dubbed this the "seven minutes of terror"). Watkins, manager of the Navigation and Mission Design Section of the Jet Propulsion Laboratory in Pasadena, Calif., attributes the success of the Mars program to sound planning and engineering. He also points out that good communication between people is critical to a well-run mission. Communication skills, Watkins notes, are often as important as technical ones. Spirited, driven, competitive—these are adjectives that describe Leo Manzano, the most decorated track and field athlete in UT Austin history. At the 2012 London Olympics, Manzano demonstrated to the world that it is possible to succeed even when the odds seem stacked against you: with just 200 meters to go in the 1500-meter race, he was in eighth place. Then, with just 100 meters to go, Manzano was in sixth place. He ran those last 100 meters in just 12 seconds, and that come-from-behind, nail-biting silver medal finish was one for the record books. "I had to fight for every second until that last second," he says. Manzano is dedicated to leveraging his standing to help others do so as well. In 2010, he created The Manzano Mile, an annual event that promotes the sport of running. Monzano donates a portion of the proceeds from the event to the Austin Community Foundation to support non-profit youth and other charitable programs. Manzano also works with the Texas Heart Institute on a program designed to help young people develop healthy habits, including exercising regularly. They've played for presidents and for audiences around the world. UT Pan-American’s award-winning mariachi band provided a musical salute to the Chancellor’s Council members. Mariachi Aztlán opened and closed the show. A rousing rendition of "The Eyes of Texas" capped the 46th Annual Chancellor’s Council Meeting & Symposium.